They appear in the Washington scene following the route of famed King Tut. the youthful Pharaoh, immortalized by the treasures found in his burial chamber.Currently their paintings and those other prominent Egyptian artists are exhibited in the Fine Art Gallery of the University of New Orleans, a stone's throw from King Tut's magnificent show. Actually, the work of Ezzedin Hamouda and Zeinab Abd El Hamid , an unusual widely travelled and honored couple - both artist professors of the Fine Arts Department at Helwan University in Cairo and both on sabbatical -- was first shown at the Intenational Monetary Fund and earlier this year ar the Acadamy of Sciences. About a year ago Zeinab and Ezzeldin settled in a sixth floor apartment on P Street overlooking Rock Creek Park and the adjoining rooftops of Georgetown. The splended symphony of greens inspired Zenab's first American painting. Coming from a country where, until Nassar, respectable women were shielded from public view. Zeinab and her daughter, enrolled in the school of communications at American University, are thoroughly liberated women. What attracts the well known couple -- professors in Egypt draw about the same salaries as members of the cabinet -- to the United States? The answer is clear and simple: The Challenge! "We are intrigued by the challenge here, we feel it every day." Fasinated by the strong personality of Mrs. Ashraf Ghorbal, Egyptian artist Professor Ezzedin Hamouda painted a likeness that transcends her surroundings. Why Washington? "We are trying to establish some poles for the support of cultural bridges that can be used by Egyptian artists in the future," Hamouda a scholarly looking man explains. They hope to meet with muesum people artists and art dealers. Hamouda, who previously served his country as cultural counselor to the Egyptian embassy in Madrid and Mexico, where he also acted as Director of the Institute of Islamic Studies, knows how to move in diplomatic circles. He just finished a larger than life portrait of the wife of Egypt's ambassador Ashraf Gorbal. How he came to paint the portrait of this vivacious lady is another quite amusing story. When Hamouda came to town, he place one of his portraits in Mrs Ghorbal's reception area. Strangely enough, and much to his dismay, people kept identifying the portrait with the lady of the house. "Since it was a portrait, nobody seemed to look at the painting as a work of art. Everybody appeared to be obsessed by the idea of relating it to a person. 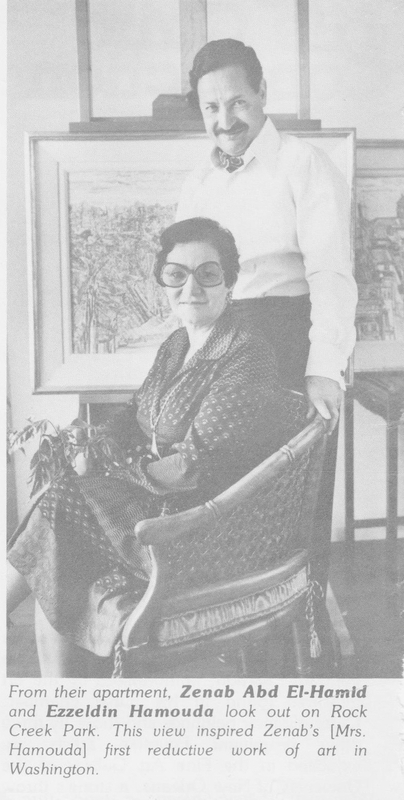 Although there was little resemblance, people insisted on recognizing Mrs Ghorbal," says the artist with a wry smile. "Finally, there was nothing else to do but show everybody how Mrs Ghorbal really looks!" Not surprisingly, the exdiplomat thinks of arranging an exhibit of American art to travel to Cairo "for the benefit of both countries. We also hope to exhibit the works of our talented artists over here. "Cultural relations and exchanges have always been part of his profession. Our art school in Cairo, founded in 1908, is two years older than our university," he observes. "The first professors came from France and Italy. Our most talented graduates used to go abroad. They returned completely absorbed by French Impressionism and other European trends. My generation came into its own in the 50s. Our cultural development went parallel with the revolution of 1952. We refused to follow foreign trends and tried to create something genuine. We tried to conserve part of our cultural tradition, a unique mixture of pharaonic, Christian, Islamic and Muslim elements, without becoming dogmatic about it, without exploiting our heritage the way artisans and commercial artists often do." "When we painted a rose," Hamouda continues, "it was supposed to have the smell of the orient. There is something ritual about oriental art. The lines and colors are clear and all parts are equal in our compositions. There are reasons for the purity of colrs and the definite lines in oriental art. In contrast to the cloudy weather in Europe, reflected in the mixed colors and blurry lines by its painters, the sunlight in the East is strong. The outlines and colors are perfectly clear. You can see for miles in the desert. Gaugin's work changed dramatically after he left Paris for the South Seas." From their appartment, Zeinab Abd El-Hamid and Ezzedin Hamouda look out on Rock Creek Park. This view inspired Zeinab's [Mrs. Hamouda] first reductive work of art in Washington. The couple is baffled by the confusion of values in the United States. They admire the simple harmony in Mark Rothko's work and the complexity of Max Ernst's canavasses. But they wonder about art dealers, the flagrant commercialism, and the great number of overrated "fashionable" painters who have not introduced anything original. "You have to respect and to know human values." says Zenab. Both of them have grown up with concept that the "mysterious and divine world of art enriches the soul" and that the basic idea of art is not subject to change. For them art is a continous process of balancing, of adding and substracting. They are of course fascinated spontaneity of American art. In their paintings nothing is left to chance or the inadvertent slip of the brush once the concept for the work has been created to their minds. In this sense, even their more realistic paintings are conceptual works of art. Both of them refuse to merely imitate reality. Zeinab offers a curiously distorted bird's eye perception of townscapes that are so sophisticated and complex in composition and tonal values that they become surreal and utterly enchanting. intensity, his colors can be transluccent like stained glass windows. There is a vitality in his reductive work that takes on a static quality of timelessness. It is this element of timelessness that stands out in his portraits. While Hamouda catches the likeness, it becomes part of his own vision. The model, so to speak, becomes a "pretext" to create a work of figurative art. The physiognomy, although respected, serves the artist's imagination as a point of departure. You have to look closely to discover the subtlety of these tranquil compositions, their fine balance of the quantity of colors, of horizontal and vertical relationships. The position of an arm may be the base of a pyramid and the swirling grain in a piece of wood is deftly juxtaposed with the subject's brown curls. Unlike Europe's old masters, Hamouda does not rely on chairoscuro, the painting of shadows, for volume and third dimension. The skin itself becomes the source of light. As a result of his first view of the gilded wooder panels in the Valley of the Kings, he sometimes uses gold leaf for his background. The artist does not expect the person posing for him to buy the painting. It is his way of safeguarding his artistic freedom , "Otherwise portrait painting is not creative and becomes work." he comments. He insists on only using models who inspire an idea of offer an artistic challenge. "The challenge in painting Mrs. Ghorbal was to paint her in her colorful Pussi dress that literally crowder the picture and still make her personality transcend the strong colors. " Hamouda, who has not painted a portrait in ten years, confesses that his interest in this art form was renewed in America. The self confidence of young beatiful and rich Americans like Hugh and Judith Marshall of Houston absolutely fascinates him. The golden-haired Judith strikes him as willful. The artist envisions in a golden dress against a golden background standing next to a cage setting the birds free. Unless a person inspires Hamouda with a fresh vision, he does not paint. Since he never paints more than two or three portraits during one year, his inspiration comes high -- from $15,000 to $25,000! On the other hand, the chances that such a portrait will go on display in a private or public collection somewhere are excellent. Outside of Egypt, Madrid and Mexico, the artist's work -- like that of his wife -- has been shown at the Biennale of Venice and Sao Paule, the Ernst Museum in Budapest, the Academy of Fine Arts in Vienna and the Petit Palais in Paris. The couple has won numerous prizes and awards. Despite his many honors, among them the title "Commander" from the Spanish Government, nothing pleases the artist more than the most recent one. The mayor of New Orleans made him an honorary citizen! It would seem that the Hamoudas may decide to stay a while.